Land ownership has always played an important part in the history of nations and great cities across the globe. No other asset class has remained in ‘vogue’ for so long, nor endured such longevity. Historically London has had a number of key landowners, or estates. The most significant and well known of which have in many cases been with us for more than three hundred years and includes the Howard De Walden Estate. The Howard de Walden Estate owns, manages and leases approximately 92 acres of property in Marylebone, with the boundaries of the estate broadly Marylebone Road to the north, Wigmore Street to the South, Portland Place to the east and Marylebone High Street to the west. Marylebone is named after St Mary’s church on Marylebone Road, with the original church having been built on the banks of a small stream, (where the suffix ‘bourne’ comes from) and is today one of prime central London’s most desirable locations and home to the Beauchamp Estates’ Marylebone office, on Weymouth Street. Much of the property now owned by the de Walden Estate was designed in the eighteenth century by architect John Prince. Prince was commissioned by the Earl of Oxford, who owned what was then part of the manor of Tyburn, to produce a master plan for a housing development centred around Cavendish Square. John Prince drew up the first plan for the estate in 1719, but progress was slow in light of the financial implications of the South Sea Bubble of 1720 that sent shockwaves through Britain’s land-owning families. When the Earl died in 1741 his daughter Margaret, who was married to the second duke of Portland, inherited the estate. The Dukes of Portland continued the building programme, overseeing construction of properties in Portland Place, Wimpole Street and Harley Street. By the 1790s, the area from Oxford Street to what is now the Marylebone Road had been developed. Leading architects of the day the Adam brothers, were commissioned to design Chandos House in Queen Anne Street and houses in Mansfield Street and Portland Place, which John Nash described as “the most magnificent street in London”. The Portland Estate, as it was then known, remained in family ownership until 1879 when Lucy Joan Bentinck, widow of the 6th Baron Howard de Walden, inherited the land and the Howard de Walden Estate came into being. By the mid-1990s the area had fallen into decline, with a third of the shops vacant. 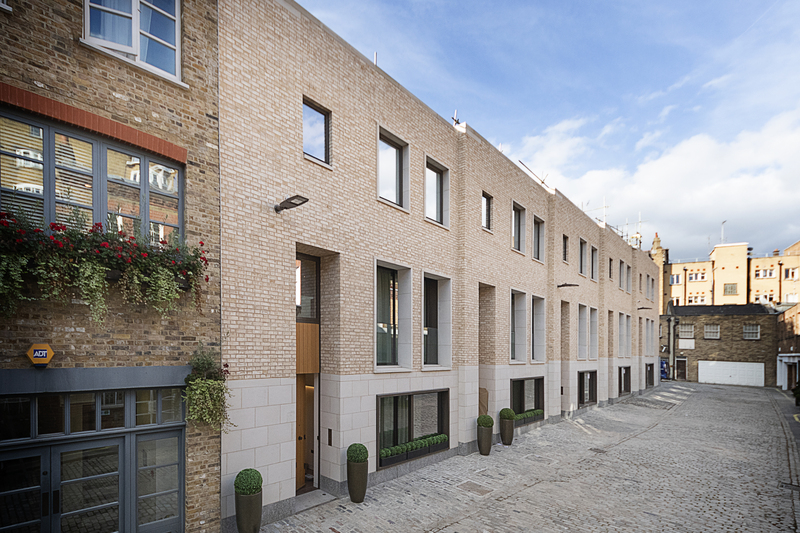 In undertaking redevelopment and regeneration of the area, the de Walden Estate breathed new life into it, both as a residential and commercial centre and continue to be excellent stewards for this increasingly famous area of central London. 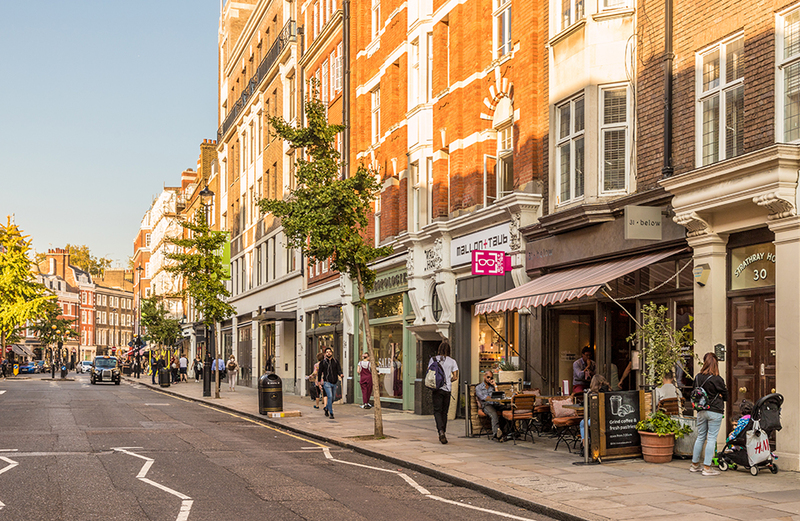 Despite being located only moments from Oxford Street and firmly in the centre of a large city Marylebone has retained a ‘village’ feel. The carefully curated high street, with its diverse range of independent and specialist retailers is a key attraction for residents and businesses alike, with the regular Sunday farmers’ market adding to its appeal. The broader area of Marylebone also offers a range of cultural attractions, from Madame Tussaud’s waxwork museum and the Sherlock Homes museum near Baker Street to Wigmore Hall, The Wallis Collection and RIBA on Portland Place. Marylebone’s property is increasing desirable and luxurious, with the majority being located in period buildings or behind period facades. The advent of such new and contemporary developments as The Chilterns, Chiltern Place and more recently the West One has increased housing stock and seen new houses in Marylebone for the first time in many decades: these prestigious new houses are currently for sale through Beauchamp Estates. Beauchamp Estates are instructed on both sales and lettings properties, in Marylebone, covering both period and contemporary properties: please contact the Marylebone office to discuss our current instructions or to place your property with us. We are happy to assist clients with advice on preparing their property for sale or to let.